Extend your SpiraTest installation with support for automated regression testing. Our RemoteLaunch application will connect to your automated testing tools and allow SpiraTest to orchestrate your testing activities, both manual and automated in one place. Automated test scripts are a valuable way to perform regression testing on applications to ensure that new features or bug fixes don’t break existing functionality. They typically supplement manual testing which is more efficient at the testing of new features and capabilities. For complete test coverage you need to perform the same automated tests across a complete spectrum of platforms, browsers, devices and environments. Using RemoteLaunch® with SpiraTest® or SpiraTeam® allows you to manage the automated testing process. Track the automated tests against the project’s requirements Have a holistic view of manual and automated testing. Using RemoteLaunch you can manage an entire global test lab from your central SpiraTest server, with automated test sets being executed using a variety of different automation technologies 24/7. RemoteLaunch can be used for on-premise, cloud or hybrid deployments without any special configuration. With RemoteLaunch's open architecture, you can schedule and track manual testing in the same environment as your automated tests - with plug-ins available for the best of breed test automation tools such as HP Unified Functional Testing, SmartBear TestComplete, Ranorex, Squish, and Selenium. Each of the plugins for RemoteLaunch is designed to use the specific information provided by the automation tool being integrated. So you get powerful rich reporting fully integrated into your SpiraTest environment, with support for screenshots, log files, detailed test reports as well as key QA metrics. Two-page datasheet that outlines RemoteLaunch's main features and capabilties. Allows Spira RemoteLaunch® to launch and execute LoadRunner performance scenarios to report back execution status against linked test cases in SpiraTest/Team. 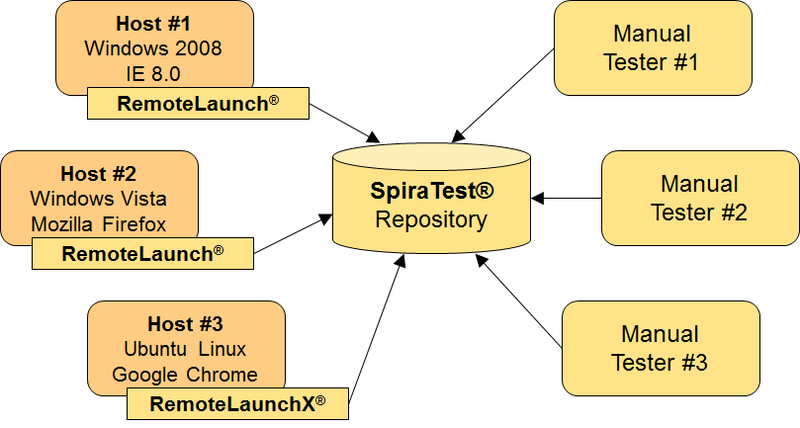 Allows Spira RemoteLaunch® to launch and execute JMeter performance/load tests and report back execution status against linked test cases in SpiraTest/Team.